The Southwest area is the most accessed entrance through the Nisqually entrance via highway 7 south of Tacoma, or via highway 161 from Puyallup. The highway becomes 706 at Elbe to the Park entrance, to Paradise (Jackson visitors center), and onward to highway 123 in the southeast area. This area can also be accessed via highway 52 at Randle off highway 12 to highway 706 at Ashford. The Longmire visitors center open daily until October and then Thursday through Mondays until spring. The Jackson visitors center is open daily until October and then only weekends and holidays until spring. The Paradise Inn closes in October. The Mountain Guide Center closes in October. The Cougar Rock campground closes in October. Area.-- The Longmire area is one of the most popular entrances and area with the visitors center, museum, lodge, restaurant and store. It is the shortest way to the Paradise area which has the Paradise Inn, Jackson Visitors Center and the NP Climbing center. The National Park Inn at Longmire is open year around and the Paradise Inn at Paradise is open seasonally (May through September). The NPS has implemented a shuttle service on weekends for the summer (through the Labor Day weekend) starting at Ashford with stops along the way to Paradise. This is due to the limited parking at Paradise and Paradise valley Road during the peak tourist days. The Sunshine Point campground was destroyed by the November 2006 and subsequent floods and hasn't been rebuilt. The next closest campground is Cougar Rock past Longmire on the way to Paradise. This is a popular campground so plan accordingly, see NPS information. All other camping is limited to established campsite on the backcountry trails and requires a permit obtained at Longmire, see NPS rules (PDF). The Westside Road is the old Puyallup Road over Round Pass to the upper Puyallup basin and trails to the northwest area. It opens around June to the trailhead at Dry Creek. You may encounter delays as the NPS works to repair the road open from winter flood and storm damage. Access.-- The Southwest area is the most accessed entrance for visitors from Tacoma via highway 7 south of Tacoma, or via highway 161 from Puyallup. The highway becomes 706 at Elbe to the Park entrance, to Paradise (Jackson visitors center), and onward to highway 123 in the southeast area. This area can also be accessed via highway 52 at Randle off highway 12 to highway 706 at Ashford. The Longmire area and southwest area is accessed through the Nisqually Entrance, from highway 706 and highway 7 from Morton or Tacoma. This is a two-lane highway with both slow and higher highway speeds, so it's usually about an hour drive from Tacoma to the Nisqually entance and Longmire area. The road to Paradise is another 30-45 minutes depending upon traffic and road conditions. Maps.-- You can get a topo map of the southwest area, or as a PDF (8 Mbytes), along with more maps from the map resources. Area.-- The southwest area of Mt. 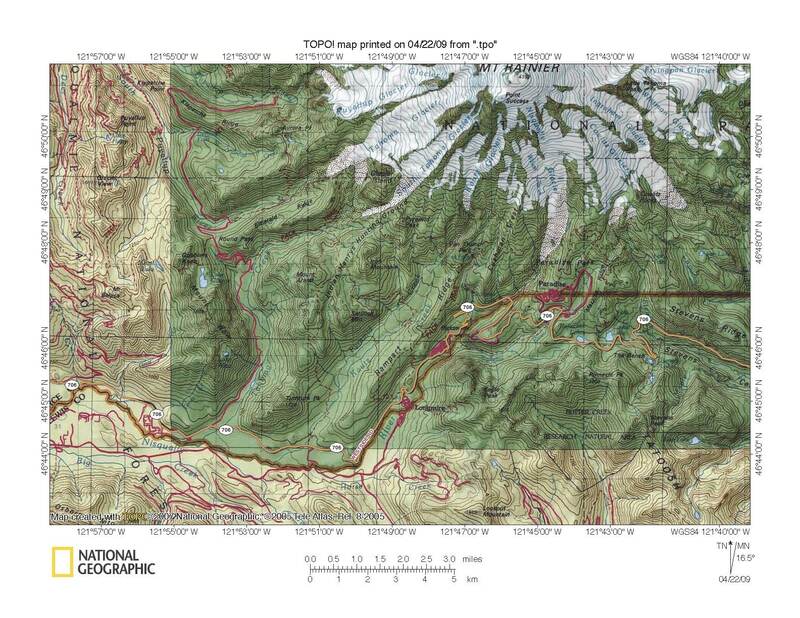 Rainier NP is defined by two characteristics, the Nisqually River and the lowland forest. The forest starts at the entrance at about 2,000 feet and rises to over 4,000 feet on the lower peaks in the area and the upper elevations in the upper Nisqually River basin below Glacier Bridge. With the exception of the northern edge of this area which overlaps into the northwestern area in the upper South Puyallup River basin and valley, via the Westside Road over Round Pass, the southwest area is within the upper Nisqually River basin from the entrance to the Glacier Bridge over the Nisqually river. And with the exception of Indian Henry's Hunting Ground, which is a vast open meadow and alpine area, the area is all old growth forest of one type or another. The southwest area from the entrance to Bear Prairie Point is defined by the Nisqually river, being the southern NP boundary. From Bear Prairie Point to the upper Nisqually River at Glacier Bridge the southwest area is the Nisqually River basin. This includes the Tahoma and Kautz Creek basins draining the north side of the Nisqually River between the entance and Bear Prairie Point and the upper Nisqually River basin in the NP above Bear Prairie Point which includes the Tatoosh and Van Trump Creeks. The drainage of the southwest area creeks and rivers are defined by the basins' glaciers, the South Tahoma Glacier for Tahoma Creek, Pyramid, Success and Kautz Glaciers for Kautz Creek, Van Trump Glacier for Van Trump Creek, and Wilson and Nisqually Glaciers for the Nisqually River. Other glaciers drain into creeks and rivers on the east side of the Nisqually River described in the Paradise area of this guide. Quite a few prominent physiographic features are found and accessible via the trails in the southwest area. Mount Wow with Lake George and Gobbler's Knob (fire lookout) is accessible via the Westside Road and trail (trailhead at Round Pass). Emerald Ridge is accessible via Tahoma Creek Trail off the Westside Road and trail (see personal note below) and via the Westside trail over Round Pass into the South Puyallup River basin. Indian Henry's Hunting Grounds is accessible via the Kautz Creek trail (trailhead at highway turnout and rest stop) or via the Tahoma Creek trail over the upper Tahoma Creek Bridge (see personal note below). The Indian Henry's area is a vast open meadow and alpine area, and always worth the 5.5 mile one way hike via the Kautz Creek trail (3+ miles via Tahoma Creek trail). Rampart Ridge via the traihead at Longmire (opposite the visitors center), offers excellent views of Kautz Creek, Pyramid Peak, a vista to the west, and Mt. Rainier. Eagle Peak is the best location in the southwest area for a complete view of the southern side of Mt. Rainier and the southwest area. The peak is accessed via the 3.5 mile trail starting across the river behind the Longmire facilities (drive through facilities to bridge over Nisqually River). The trail end at the peak is directly 3 miles south-southwest of Mt. Rainier and always worth the hike. The last prominent feature in the southwest area are the many waterfalls (see waterfall guide). Mapcap and Carter Falls are accessible via the trailhead off the highway past Longmire. Christine and Comet Falls are accessible via the trailhead at the parking turnout on the highway to Paradise about a mile before Glacier Bridge. This trail goes beyond the lower falls to connect with the trail to Van Trump Park and Mildred point, another open meadow and alpine area with excellent vistas of the area and Mt. Rainier. Notes.-- You can get a topo map of the southwest area, or as a PDF (8 Mbytes) along with more maps from the map resources. You can learn about the geology of the NP from the geology guide along with a map guide for the highways approaching the NP and in the NP. Early (pre-NP) years.-- The southwest area, along with the Paradise area, were the first areas in and around Mt. Rainier to be extensively travelled and explored. While the northwest area was explored about the same time, the southwest area proved the preferred route to Mt. Rainier, in part due to the towns and settlements to Mt. Rainier and the later developement of the railroad along the same route. It was the popularity of this route which prompted the development of the road to present day Longmire, where Longmire's settlement provided lodging and supplies for those on the way to the Paradise area, and then to the Nisqually River and glacier and eventually the Paradise area itself, but these latter two extensions wouldn't see completion until after it became a NP. Once the Paradise area had become the established destination for visitors and mountain climbers, the southwest area become more developed, although too often not very well or sanitary due to the circumstances between the original settlers and railroad company for travellers. In the the end, while being a good destination, it became more of a stopover to Paradise. Early NP years.-- Even after the NP designation, the southwest area didn't improve much, only the issue now included the Department of Interior, now owner of the NP, and later National Park Service over the extent and quality of the facilities. This didn't change until several things happened. First, the Interior Department and later NPS built a sewer treatment system and forced the existing lodging and facilities to connect to it. They also pressured the owners to improve their lodges and facilities or face closure. Things really improved when the NPS took over the NP and looked to improve the visitor experience and facilities. The second was road. The Department of Interior pushed for a road to Paradise. This was accomplished in steps, first a better road to Longmire and then to the Nisqually River crossing where the first Glacier Bridge was built. Then from the bridge to Paradise. This wasn't fully realized until the mid-1920's. The last was the acquistion of the land and mineral claims. This took years and some luck with the commercial interests for this to be realized and then the land and facilities were under the NPS control and management, and they could oversee better conditions for visitors. This, however, took into the 1930's to be full realized. Once the road was complete and improved, Paradise really became the visitor desination and the southwest and Longmire area didn't change until the 1930's when the newer lodge was built and the NPS built their facilities there for the area for nearly year-around access to the area especially in the winter when the road to the Paradise area was closed. Recent NP years.-- Today, it's its own destination for visitors wanting to explore the southwest area with almost year-around lodging and facilities. Often from late fall to early spring, the lower elevation trails are snow-free and provide excellent access to the higher elevation trails with the Westside Road for additional trails and snow activities with miles of road to Round Pass and the Puyallup River valley. It's safe to say much of the area hasn't changed in the area in the last few decades. With all the Depression and WW II temporary facilities gone and the NPS focused on other needs in the NP. The roads, trails and facilities were fully established as the NPS worked on the development of other areas. But some of this was luck as the area didn't experience significant damage from seasonal events, until the 1990's. One significant change in recent years is the seasonal closure of the Westside Road October to May (open for hiking and snow travel) and then open only to the Fish Creek crossing (trailhead) since the glacial outburst floods on Tahoma Creek in the 1990's destroyed parts of the old road from the Fish Creek crossing for about a mile to the Bridge on to Round Pass where the creek incorporated the road into the new channel. The second of the events was the November 2006 and the subsequent winter floods of 2007 and 2008 which closed the area at the NP entrance for periods for road and bridge repairs when high flows in Kautz Creek filled the channel above, through and below the bridge, and then changing channels in the upper basin and establishing a new channel east of the bridge. It will take years to determine alternatives, then engineer solutions and complete the work. Area.-- There is a variety of trails from the highway, see trail guides, from just past the entrance east to Longmire and on to Paradise. Several are easy hikes, such as the Twin Firs and Trail of the Shadows, and moderate hikes with views, such as Kautz Creek, Rampart Ridge, along with the trails to the waterfalls. Along the highway here are a number of turnouts, trailheads, and viewpoints, such as Kautz Creek, Glacier Bridge over the Nisqually River and at Ricksecker Point, see paradise area, including trails to Christine, and Van Trump Falls, see waterfall guide. The Westside Road is the old Puyallup Road over Round Pass to the upper Puyallup basin and trails to the northwest area. It also has trails off the road to many areas into the backcountry of the area, including Lake George, Gobbler's Knob (lookout) and Emerald Ridge. The road, when open, is 3.2 miles to Fish Creek where there is a trailhead at Dry Creek. The road after the lower Fish Creek crossing for about a half mile is part of Tahoma Creek and in generally poor condition being frequently washed out by winter floods, spring snowmelt and outburst floods. After the upper Fish Creek crossing, the road is in fair to good condition over Round Pass to the end, great for mountain bikes. For the hikers who wants a better challenge, quite a few are longer trails, some connecting to the Wonderland Trail, such as Kautz Creek, and other trails leading to waterfalls and viewpoints, such as Carter and Madcap Falls, Comet Falls, Pyramid Creek Camp, and Eagle Peak The Westside Road, mentioned above, has a many trails to more remote areas on the west side of the NP. Notes.-- All the trails will have snow above 2,500 feet and lower for during and after snowstorms. You should always check the NPS Website for the latest trail conditions through the spring as the weather and conditions can change quickly and severely overnight or during the day. You should always be prepared with your gear, be flexible with your plans and have emergency equipment. Photo Ops.-- The photographic opportunities in the southwest area are plentiful but few places where Mt. Rainier is clearly visible for scenic or landscape photos. This is due to the terrain in the area which is heavily forested with few places near or above treeline or with	places with a view of Mt. Rainier. But if you're willing to hike some distance, usually 3-5+ miles one way, you can find some excellent views of the mountain, such as Gobbler's Knob, Eagle Peak, Mildred Point and Indian Henry's. In addition you can get some partial views on other trails, such as Rampart Ridge and Kautz Creek - at creek crossing one-plus miles from the trailhead at the highway reststop. If you're willing to hike farther, the Westside Road trail over Round Pass into the Puyallup River offers many full and partial views. One of the best photo opportunities in the southwest area are for waterfalls on the road between Longmire and Paradise, where many are easily accessible from visitor turnouts and trailheads. You can get more from the waterfalls Web page. Some of these, such as Christine Falls and Narada Falls, are the most photographed waterfalls in the NP, so you can find many on-line images to judge for yourself. Another photo opportunities are the forests and creeks. The road from the Nisqually entrance to Paradise offers many opportunites to see the old growth forest of the western Cascade mountains in the NP from about 2,000 feet to treeline. In addition you can get many opportunities to photograph the Nisqually River and several creeks, such as Tahoma and Kautz Creeks. While much of the NP is old growth forests, there forest areas which are recovering from flood damage or fires which afford excellent photo opportunities. These areas offer better light conditions with the younger trees, may have some standing dead or burnt trees, and open the undergrowth to new bushes and plants not normally found in old growth forests. Plants and wildflowers are a usual subject of many photographers. You can locate wildflower areas along with the any print and on-line resources for information, see resources section below. The wildflower season doesn't begin until mid-to-late July, but varying with the snowpack and snowmelt, early July with a low snowpack or early snowmelt orlater with a above normal snowpack or later snowmelt. You will find many smaller open fields and meadows amidst the forest throughout the southwest area, especially in the forest around small creeks or recovering from forest fires. They're worth exploring but you should exercise caution when hiking into and walking around these areas to minimize your footprint and damage from any camera equipment or bags. The southwest area has access to several upper elevation meadows, the best being Indian Henry's, but also Klapatche and Van Trump Parks. These areas, however, don't really bloom until July into August. Here, you have to monitor the reports to find the best time each year. Vista offer panoramic views of Mt. 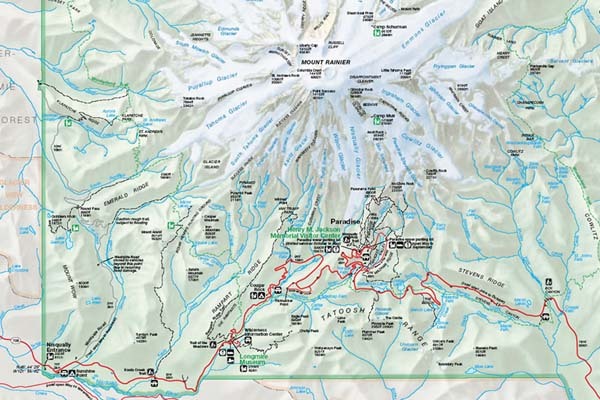 Rainier and the surrounding area, which includes trails to Eagle Peak, Gobbler's Knob, Kautz Creek, Mildred Point and Rampart Ridge, and the Westside Road. View offer views of the natural environment, such as forests, creeks, lakes, glaciers, etc., which includes road side turnoffs at Glacier Bridge and Sunshine Point campground, and trails to Tahoma Creek suspension bridge and Emerald Ridge, Trail of the Shadows, Twin Firs trail and upper Kautz Creek area. Watefalls offer views of commonly known or easily accessible waterfalls, such as Carter Falls, Madcap Falls, Christine Falls and Comet Falls. Open Area offer views of alpine meadows and open alpine and glacier environments, such as Indian Henry's Hunting Ground. Photo tips.-- Photo tips are hard due to the diversity of photographic interests and range of cameras. But for the most part, it's the old adage, it's about the light. This is one area in the NP where you can get some interesting photos any time of the day and almost any place you are, go or hike. The key is to be flexible for the range of light you'll get and the exposure you'll need, from deep inside forests to panorama and scenic views of Mt. Rainier. While it's not always necessary, I would recommend having a tripod for many of the photos, especially for photos of small subjects such as flowers, plants, etc., where you'll need a good macro lens, a cable release or control, and perhaps a small fill-in or macro flash. There are many opportunities for photos of flowers, plants, and other small and closeup subjects. This is especially important as wind will be a critical factor in most places and especially in open areas. Mt. Rainier is famous for the wind and circulation patterns around the Mountain, and is often a factor even in seemingly quiet areas in forests. In these cases, if possible, it helps of have a wind break, or use faster shutter speeds (offset opening the aperture) to stop the subject. The next tip would be with lenses, which you can find a description with hints and tips here, but mostly a good wide-angle lens(es) and a short telephoto, something in the 200-300mm range with perhaps a 1.4x or 2x tele-extender. I personally find my self using the focal lengths between 35mm and 135mm with 45mm to 85mm the most along with a 180mm macro lens, which doubles as a short telephoto lens. Advisories.-- There isn't much I can say about advisories except pay attention to the NPS reports and the park rangers. The backcountry rangers are the most experienced and helpful folks there. Ask, listen and heed their advise, and you won't go wrong. And keep up with the latest NPS information as you can. Above all, please follow the rules and your permit. The rules are there for everyone's safety and protection of the resources. And the permit is to minimize the impact of your trip on the NP and for others. And please follow some personal suggestions. First, a note about glaciers. Second a note about the wildflower and alpine meadows. Resources.-- Don't forget to look at the wealth of books and Websites (using Google image search) by photographers who have images of Mt. Rainier and write down the locations of where the photographer took the image(s). Some will provide this information, but as I have found in my discussions with photographers, most won't. If you have questions about some photos, you can contact me with the the book or link and I'll do my best to determine where the image was taken. The Westside Road and trail beyond Dry Creek is one of my favorite places, especially the Tahoma Creek trail. This trail, although not usually found in newer trail guides, is used by backcountry rangers because it's the shortest and quickest route to Emerald Ridge and over the upper Tahoma Creek high bridge to Indian Henry's Hunting Grounds. The Westside Road is closed for the season at the highway from about mid-November (usually the 15th, but earlier depending on the weather) to sometime in April or May after the snowmelt and the NPS has checked and repaired the road from the previous winter storms and floods. The road from the highway to the Dry Creek trailhead is an excellent winter hike of 3.5 miles with 500 feet elevation gain. It starts on the Round Pass road-trail at the first bend about a quarter mile after crossing Tahoma Creek. It's not flagged or marked through the forest. You should always ask the condition at the Longmire Information Center as several parts may be washed out or hazardous from winter floods or destroyed by landslides. This is especially true in early summer before they have done a reconnaissance and maintenance of the trail. The Tahoma Creek trail is not maintained and not for novice or casual hikers. A last word of note is the highway from the Nisqually entrance to Longmire and beyond to Paradise. The highway is narrow in many places and does not afford the places to park along the highway to stop and access the nearby forest. You should restrict your parking to established turnouts and parking areas, and only park at other places where you can safely pull completely off the highway without impeding or endangering traffic, bicycles, and others. Don't be surprised, however, if a NPS ranger asks you to move to the nearest turnout.